What's that now? No, don't blame Ingolstadt. 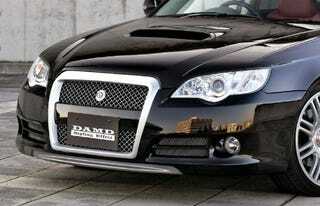 This nose belongs to a Subaru Legacy that's been fitted with a kit by Japan's DAMD design house. Despite the mimicry, DAMD says the design is functional, improving cooling and aerodynamic efficiency. We're not quite sure who gets the last laugh on this. Perhaps no one.